It's a new year and time to make those yearly goals. Last year I was waaaay too ambitious with my DIY goals. I made 30. I didn't leave room for life getting in the way and boy did it. I only finished 12 of my 2012 DIY goals. I supposed I could cheat and make my missed 2012 goals my 2013 DIY goals but there are a few items I'm not sure if I want to do like building a fireplace mantel. I want to live sans mantel for awhile to test the waters. 1. Concentrate on projects using the items I already have. I'm not saying I won't buy any new materials or components to complete the project if that's what the project requires but I really need to knock the growing list of projects off my Someday list. 2. Find/create storage. 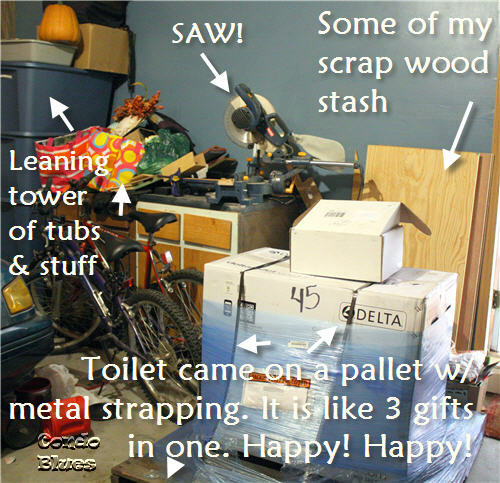 We're pretty good about purging and donating the stuff on a regular basis so things don't pile up. But there are some things we like to keep around, like say food but only one designated cabinet in the kitchen for it. I have some stuff stored in plain sight (aka no place to call home) as a temporary thing for far too long. 3. Make my kitchen cabinet workbench. I have everything to make over the cabinets into a workbench, including the wood for the bench top. I just need to do it because as it stands right now my workbench is far from useful. There is a workbench to be somewhere in this photo. I think. 4. Hang our bikes. I have the hangers. I have the tools. I have the knowledge. All I need is to sweet talk Husband into being my holder upper guy. Since Husband hates being my holder upper guy with a fiery passion (he'd rather be running than holding) this item may go on my DIY goal list until the end of the millennium. 5. Add some personality to the upstairs bathrooms. 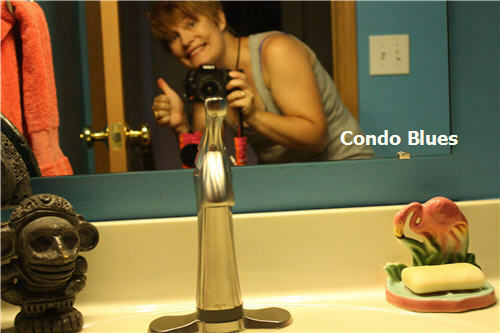 I haven't done much except paint both rooms and install a super cool Delta Touch 2xO faucet in the guest bathroom. I love this faucet more than I care to admit. 6. Install the new toilet in the half bath. I have it. We're climbing over it every time we walk into the garage. It's time to install that bad boy and donate the old one to Habitat for Humanity. 7. 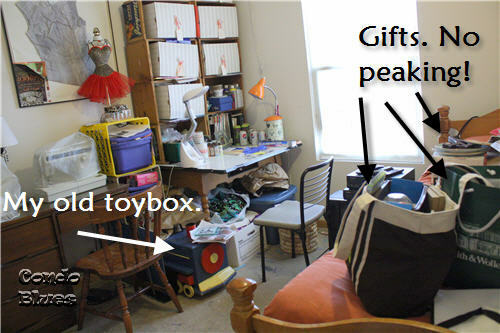 Paint the sewing room/guest room/hot mess I want to light on fire room. The walls are damaged and need paint. I bought paint for this room during a Labor Day sale knowing I would get to the project later. It's later. Time to paint. This is supposed to be my creative space. The clutter and mess makes it my crabby space instead. Those are my 2012 DIY goals. Do you make New Year's Resolutions or Goals? How good are you at keeping them?